Portable toilets are a convenient way to provide temporary restrooms for workers or guests, even in areas without water or sewer hookups. Today's portable toilets are available in many sizes and even have optional features, which span from hand washing spaces to hardwood flooring. Temporary toilets are used in many places, from private affairs and public venues to construction sites and farms. Equipment Rental Direct can help you find affordable portable toilet rentals for your upcoming project or event. Portable toilets have really come a long way over the years. Once considered a last resort due to odors and messes, temporary toilets are no longer places to avoid. Improved engineering and luxurious features mean that portable toilets are now more user-friendly. Portable toilets can be found at nearly any outdoor event or workspace. Weddings - Wedding planning for an outdoor reception is not complete without portable restrooms. Consider the trailer style restrooms for a VIP experience. Corporate Events - Make the next corporate event more comfortable with roomy portable toilet rentals. ADA compliant toilets and family-sized restroom rentals take the worry out of any outdoor event. Construction Sites - Portable toilets are a common site in construction zones where plumbing is not yet installed. In fact, some areas mandate the availability of portable toilets in construction zones. Sling-equipped toilets are also available for sites where toilets are needed on multiple levels of a building. Concerts - Standard and ADA compliant portable toilets seem to be the rental of choice for concerts. Plan on renting 50 units every 10,000 patrons during a concert of typical duration. Carnivals - Carnivals are best served by a combination of standard units, ADA compliant toilets, and family restrooms. Farms - During planting and harvest season farm workers will need access to clean, sanitary restroom facilities and hand washing stations. Renting is the best way to go when you only need facilities on a seasonal basis. Parks and Camp Sites - Portable toilets are often preferred over outhouses at parks and on campsites where permanent restrooms are not installed. Portable toilets are easier to clean and offer a brighter and more private space. 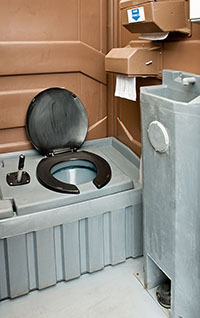 Disaster Areas - After a tornado, hurricane, earthquake, or other natural disaster, portable restrooms can be placed at gathering spots for public use, or may be rented for private use until crews are able to repair downed utilities. Whether you are renting a portable toilet for personal use or for a company event, knowing what to expect during the rental process is beneficial. Companies that work in the portable toilet business are accustomed to working with clients who have never experienced the need for a portable toilet rental before, and they are more than willing to help you figure out the number of portable toilets you need for your event. Rental fees can start as low as $90.00 a day for a single standard unit. You will see significant savings per portable toilet when you rent multiple units at one time. Weekly rates are typically twice the cost of a daily charge, whereas monthly rates for a portable toilet could be as low as $350.00. Most companies include delivery at no additional charge when you rent a portable toilet. It is, however, a good idea to confirm this information at the time of the rental. In addition, ask the representative about environmental fees, surcharges, and damage waivers. When you secure a long-term rental (weekly or longer) the company will talk to you about the cleaning process. Most rentals include sanitation and cleaning by the company technicians once per week. With all of the choices in portable toilets it can be hard to know which to choose. Equipment Rental Direct provides an overview of the portable toilet rentals available for construction, corporate, small-business, or personal rental. Standard Portable Toilet - This is the most basic design in portable toilets. The unit comes with a molded toilet seat, rolling toilet paper dispenser, and air vents. Extra-Wide Portable Toilet - Extra wide temporary toilets feature more space inside to accommodate costumes, gowns, and bulky or formal clothing. This style also has a translucent roof for natural lighting and a hand washing sink that is operated via a foot pump. Some units may come with artificial lighting installed. ADA Compliant Portable Toilet - ADA compliant portable toilets do not have a threshold that could impede entrance or exit. They come with interior handrails and also have enough room for a wheelchair to enter and make a complete turn. Portable Toilet with Flushing Action - The flush equipped portable toilets are less prone to odors than those without flushing action. Many flush-equipped units also have a coat/purse hook and a small mirror. Some units feature a small corner shelf. Sling-Equipped Jobsite Toilet - Intended specifically for construction zones where restroom facilities are needed in high areas without indoor plumbing, the sling-equipped portable toilet is safe to lift using a crane. Portable Restrooms for Families - Approximately the size of an extra-wide portable toilet, the well-lit family restroom is equipped with a changing table, garbage can, and space to hang a diaper bag. Trailer Restrooms - The starter level trailer restroom has two entrances; one goes to a private area with three partitioned stalls, while the other goes to a private area with urinals and a single stall. The trailer also has lighting, mirrors, and a complete sink. VIP Trailer Restrooms - The VIP setup is similar to the starter level trailer restroom in design; however, it is much bigger and uses premium materials for the walls, flooring and fixtures. The VIP trailer restroom also offers piped music and climate controls for ultimate comfort. 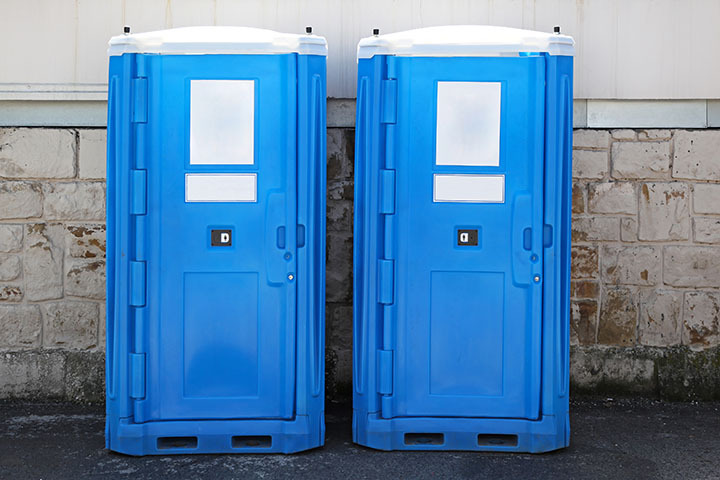 Whether you are a general contractor looking for reasonably priced portable toilets for a jobsite or a wedding planner looking for deluxe portable restrooms, Equipment Rental Direct can help you find portable toilet rentals from local, reputable businesses.